﻿ Does polyurethane screen appear damaged phenomenon such as how to remedy? A: quality problem of polyurethane screen is an important factor that causes too fast breakage of polyurethane screen. 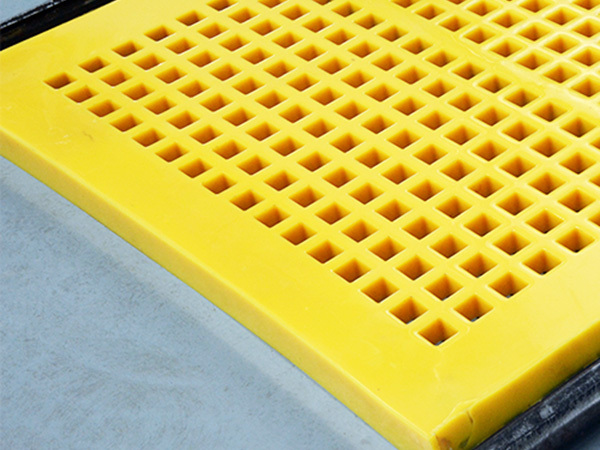 polyurethane screen material if not reach the screening requirements of the material, polyurethane screen damage quickly, Ding Tai experts to remind the majority of users to choose the right polyurethane screen. Dingtai experts remind users to choose reliable polyurethane screen . B: polyurethane screen tensioning force is not enough, so that the cause of polyurethane screen fibrillation, usually along the edge of the polyurethane screen or wrapping layering at the fracture or damage. Ding Tai experts remind the majority of polyurethane screen users, to always check the tension of the polyurethane screen, polyurethane screen to check whether the installation is firm. C: material feeding problem.Because in the process of vibrating screen continuous feeding, but if a feeding too much, hinders the normal movement of materials in the screen surface, not only easy to make polyurethane screen fatigue lose, and will greatly reduce the amount of material handling. Disposable give a lot of material, will make itself in an unbalanced operation of the motor load suddenly increases, not only easy to damage polyurethane screen, and is likely to cause damage to the vibration motor, so when put the material to be uniform feeding. In the strong impact of the feeding mode, must be to the shaker polyurethane screen installation buffer Hopper, the direct impact of materials polyurethane screen will consume the excitation force generated by the vibration source, more likely to cause damage and screen fatigue polyurethane screen. Dingtai experts remind: if it is sieving liquid when there is a strong impact force is best to add a hopper or buffer. If there is material accumulation, as soon as possible to find the cause such as adjusting the vibration motor eccentric block and so on.